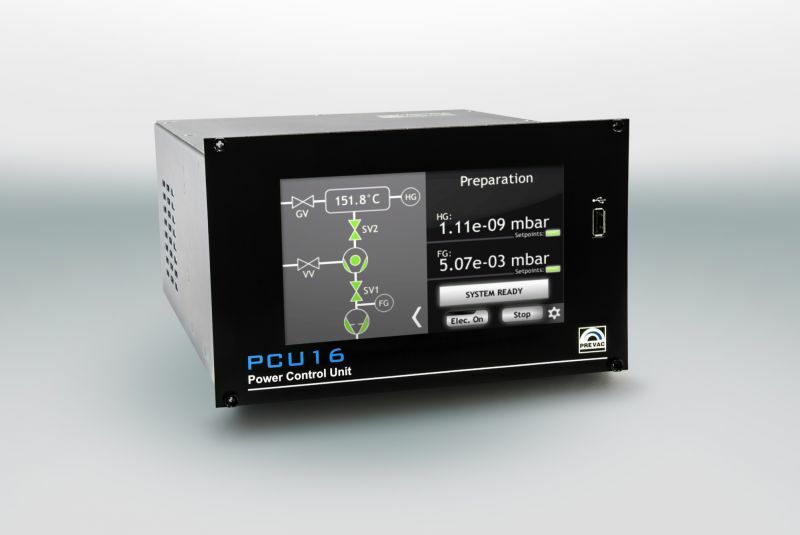 The PCU16 Power Control Unit is a compact, standalone microprocessor device for controlling one complete UHV vacuum system. It supports one ultra-high vacuum pump (e. g. turbo molecular pump, ion pump, cryo pump, etc. ), electromagnetic vent valve, electromagnetic safety valve, fore vacuum pump and two vacuum gauges based on the 0 - 10V output standard. The PCU16 displays the state of all of the connected peripheral devices on a large 7″ TFT LCD touchscreen, providing clear readouts of important system parameters to the user. The unit comprises several interlocks to protect the vacuum system in the event of power loss or in the case that a pump or other device might fail. Five different and most popular configurations are implemented on the delivered unit. Customers can choose one of these fixed configurations and set it as the default display. Easy firmware upgrade via USB. Unit can be remotely controlled via RS232/485 or Ethernet interfaces. The PCU16 has an externally attached UPS ensuring full control and protection of the vacuum system even on power failure. It is available with full dedicated software application or library module. Dimensions 212.6 x 128.4 x 260.3 (WxHxD), ½ of 3HE 19"